I got excited during the opening of the new James Bond. During the big car chase, a character said, “They’re heading for the quarry!” I’m into quarries and figured something really good was going to happen. After all, the best scene in the last Bond was the chase through the construction site. But Bond-in-the-quarry was a little disappointing: no great stone moments, no Indiana Jones boulders, nothing particularly quarry-specific. Bond drives really fast, dodges a lot machine gun fire, then shoots the driver of the other car and wins. Note to villains: machine guns don’t work against Bond. I occasionally come across links to webpages about former quarries. I’m going to try to keep some of them bookmarked here. We’ll see how many I add over time. 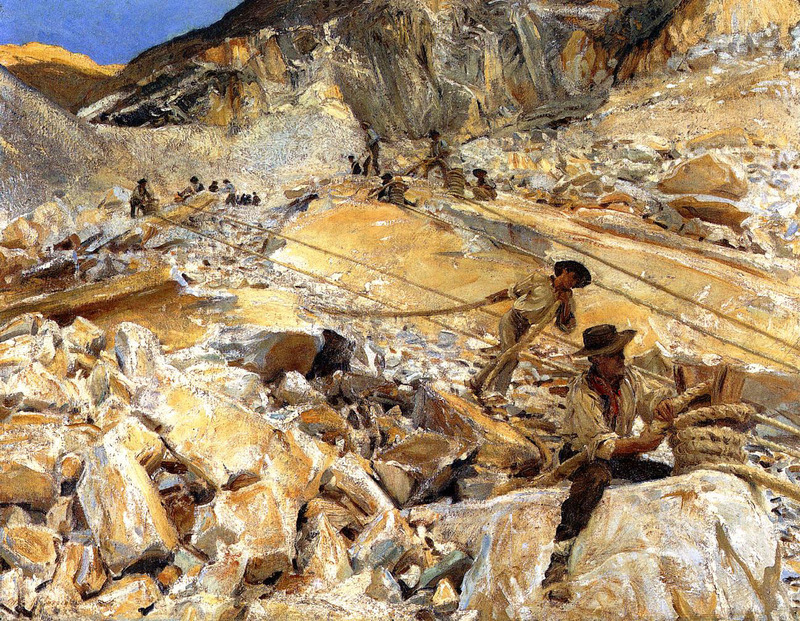 John Singer Sargent did a number of works at the quarry in Carrara. My favorite is above, a rare instance where I like an oil better than the watercolors. Others from his Carrara paintings and drawings can be seen here. I also like a quarry watercolor by Stewart White. Other paintings include Old Quarry, Rockport by Henry Aiken Vincent, Quarry of the Chaise-Mre at Fountainbleau by Corot, The Sand Quarry by Guillaumin, Chou Quarry by Gauguin, a series at Bibemus Quarry by Cezanne, Bibemus Quarry was also painted by Andrea Masson. I can’t find Childe Hassam’s series at Rockport Quarry online, and I don’t particularly like The Quarry Pool, Folly Cove, Cape Ann. 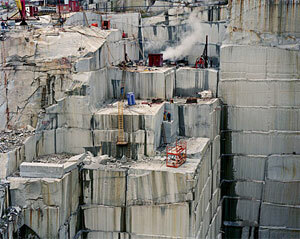 The best quarry photographs, including ones from Carrara, are by Edward Burtynsky. Burtynsky’s website has a great gallery of quarry photos. The best quarry scenes in film are the ones in Breaking Away. Garden State has a quarry scene too. I have mixed feelings about it. Quarries and Beyond has the most info. Quest has a writeup on some of the old quarries in the Bay Area. Parc des Buttes Chaumont is probably the most famous park made from a former quarry. Opus 40 by sculptor Harvey Fite, a quarry site turned into a massive dry stone sculpture. It’s currently falling down because he didn’t break his joints, but there are efforts to preserve it. Robert Morris made an amphitheatre/scultpure from a gravel pit, Untitled (reclamation of Johnson Gravel Pit). Robert Smithson’s Broken Circle/Spiral Hill is in a former sand quarry in the Netherlands. IHilary Anne Frost -Kumpf has a webpage about reclamation projects which includes info on the Morris and Smithson pieces, Opus 40, and a Michael Heizer piece Effigy Tumuli. Quarry Garden in Shanghai Botanical Garden, a former quarry turned into a park, won an ASLA award in 2012. Reordering Old Quarry, a residential landscape on a former quarry, by Reed Hildebrand also won an ASLA award in 2012. A video about the Quarryman, a rock climb at a stone quarry, has some historic footage of quarrying. This entry was posted on Saturday, January 3rd, 2009 at 12:17 pm and is filed under quarries, stone. You can follow any responses to this entry through the RSS 2.0 feed. You can leave a response, or trackback from your own site.